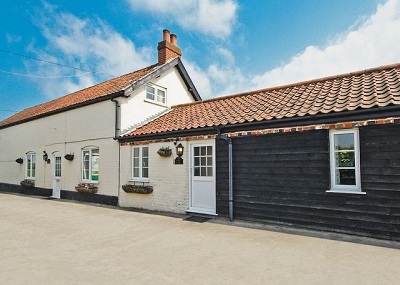 Appletree Cottage is a two bedroom holiday property sited in Yaxham, near Dereham in Norfolk. It is one of a row of small cottages, which belonged to mill workers in the Victorian era. The cottage is next to the Yaxham Mill built in 1860, and the shared grounds include a restaurant/cafe, which offers very good food. The cottage has been decorated to a high standard and comprises a comfortable lounge with sofas and a flat screen TV. The kitchen/diner with dining table and chairs, also has a woodburning stove. There are two bedrooms, one with a double bed with pretty feature dressing table and mirror and the other with 2 single pine beds with pine wardrobe and bedside tables. There is a small garden with patio furniture. The owners do allow a small well behaved dog. But this is a non smoking cottage.